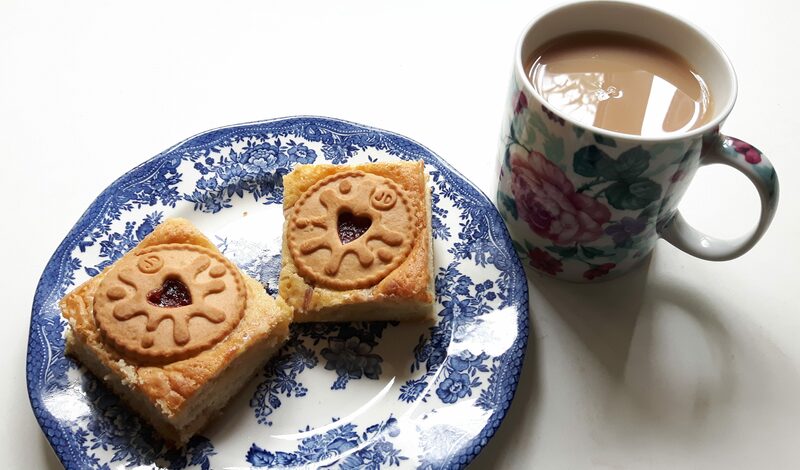 I actually made these for a Macmillan coffee morning to raise money for charity, but the idea was that they’d be an easy peasy gift for Valentines Day… easy to make, can be made last minute, and gets the ‘ahhhh’ homemade appreciation thumbs up. The ingredients only cost around a fiver too if you go for basics/supermarket’s own (or much much more if you’re reading this Luke)! Makes 12 or 16 squares, depending on how big you want them. Before you start, pop the marshmallows in the freezer, so that they keep their shape when added to the chocolate. An hour in the freezer is best if you can wait that long! Start by lining a 20cmx20cm tin with baking paper so it’s ready. Next, put the chocolate, golden syrup and butter in a pan, and weigh out the cherries, sultanas and rich teas. Melt the contents of the pan over a medium heat. Stir well until everything is melted and smooth, then remove from the heat. Pour out about 125ml of the chocolate mixture and set aside. Stir the biscuit, sultanas and cherries into the chocolate in the pan. Take the marshmallows out of the freezer and add these too. Stir well until everything is combined. Pour into the tin and press down evenly, especially in the corners. Pour over the remaining chocolate and smooth across the surface with a spatula. Arrange the Jammie Dodgers, sweets and sprinkles, pushing down into the chocolate slightly to secure, then put in the fridge to set. It’s best to leave it for 2 hours before cutting into squares, or overnight if you can, so that you get a cleaner cut.